Oregon is a beautiful place to bike! For those that live in the Portland Metro region, there are lots of resources available to help you enjoy a pleasant ride along lower stress routes to your destination. Local municipalities offer great bike maps including City of Portland, Washington County , Gresham, Tigard, Eugene, Bend, and Ashland. Find a local map for your area here. Want to go on a two-wheeled adventure? Check out the Oregon Scenic Bikeways and ODOT’s statewide resources . Cycling facilities come in a wide range of shapes and styles, from shared-use paths and trails to on-road infrastructure like bike lanes. In Portland, riders can access a number of multi-use paths as well as an ever-expanding network of on-road bike facilities for getting to and around the city - in total, there are over 350 miles of bikeways on the ground in Portland (including 77 miles of Neighborhood Greenways, 188 miles of bike lanes, and 85 miles of paths!). If you're unsure of how to navigate Portland's streets and trails, check out Metro's BikeThere! interactive map, or consult Google Maps' bicycle route feature. 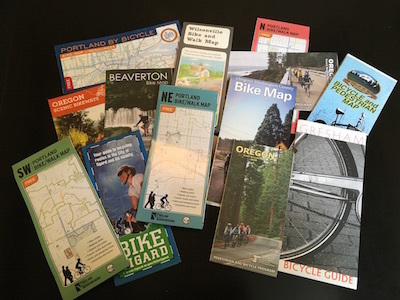 If you prefer a map you can print out, the City of Portland has a selection of handy pdf bicycle maps here as well. And you can always ask a friend who rides a bike (or contact us!) for guidance as well! This mix of facility types in the area affords excellent cycling opportunities for all experience levels and trip types, whether you are commuting to work, running to the store, hitting the town on the weekend, or getting some exercise and fresh air. Portland is also home to some spectacular recreational facilities (see below for details)! Biking and walking trails like the Springwater Corridor, Marine Drive, the Trolley Trail and the Westside Trail are great places to enjoy riding your bike. Plus Portland and other cities around the state have built networks of neighborhood greenways, which offer low stress routes along neighborhood streets so you can bike across town away from the main traffic routes. Check out the map resources above to find low stress routes in your area. Want to participate but don’t have a bike? Bike share with BIKETOWN. Looking for more of a bikeshop rental experience? Visit a local bike shop and go on a pedal adventure! Live outside the Portland area? Find a shop near you! Oregon boasts some of the best cycling in the states. 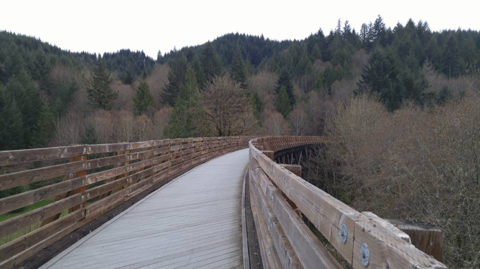 The Banks-Vernonia Trail is a great Rails to Trails project just outside Portland, that offers 20 miles of blissful riding through farmland and Stub Stewart State Park. Turn your weekend into an adventure along any of the 15 scenic bikeways Oregon has to offer. Check out the Oregon Scenic Bikeways and ODOT’s statewide resources to find bike maps and resources in your area!